I guess your gang doesn’t take it too well when you run off for a month with your best friend and leave everyone high and dry. This happens to be the problem facing Jughead Jones at the moment. In his absence, some have gotten into mischief and some got hard up for cash. In the case of Cheryl and Toni, they got bored and decided to have some lawless fun. As for Fangs Fogarty, his mother is going through some treatments that his family can’t afford to pay the hospital bills for so he’s resorted to dealing Fizzle Rocks to cover expenses. To cap it all, Jughead’s father, FP, isn’t doing so well just sitting on the sidelines. 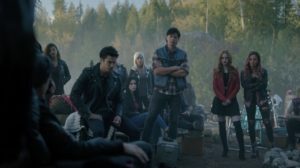 Jughead does manage to broker a deal with Veronica to get the Serpents paid and he does manage to recover some stolen goods from Cheryl and Toni but Cheryl, Toni, and Fangs have to turn in their jackets for going against the code. Initially, it was just Cheryl and Toni until they ratted about Fangs being pardoned for his mistake because someone had a big mouth *coughSweetPeacough*. Needless to say, Fangs accepted his mistake but Toni and Cheryl refused to turn in their jackets. Jughead is struggling with this considering that he didn’t leave anyone in charge during his absences and his mistake cost him three of his own. 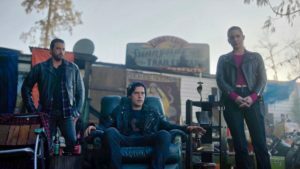 However, Jughead and his father decided to give Fangs a shot at redemption and a way back to the Serpents by way of infiltrating the Gargoyle gang in order to have a man on the inside to help take down Hiram. 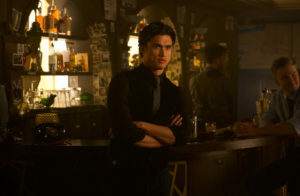 Fangs agrees and I can’t wait to watch the beginning of the end for Hiram. Now that Riverdale has turned into a town with a drug kingpin aka Hiram Lodge and a new gang the Gargoyles, it seems the depraved little town is no longer safe and the smart option for business owners is to pay protection money. This happens to be the latest dilemma facing Veronica Lodge and her speakeasy, La Bonne Nuit. While the place has picked up in terms of business, dear old dad wants 10% of her earnings if she wants to keep her business. She’d been putting Hiram off for a while, but now his little Gargoyle gang ambushed Reggie during his beer run to send a message. Veronica tries and fails to deceive dear daddy by agreeing to pay him protection money by showing him cooked books to make him think she makes less than she does at La Bonne Nuit. But he’s no idiot and makes another statement by intimidating Josie McCoy who is Veronica’s songstress for La Bonne Nuit. In order to make things right, Veronica has to pay the full amount of protection money and recover her mother’s Glamourgé egg, which was stolen by Cheryl and Toni. As a topper, Reggie got ambushed by the Gargoyles again when he went on another beer run, but this time a load of Serpents has his back in order to send their leader a message. Oh, how the mighty have fallen, for now. So far the Sisters of Quiet Mercy have refused to incriminate Hiram Lodge for his dealings with the asylum and its charges. In fact, they’ve now gone so far as to assume a vow of silence as part of their religion. Right now the case against Hiram Lodge is looking weak to non-existent at best. This all turns around for Betty when someone from Child Services lets her in on a little secret: it turns out that the Sisters of Quiet Mercy were disbanded after allegations of cruel and inhumane practices over 60 years ago. Armed with this knowledge, Betty and Sierra McCoy confront Sister Woodhouse, saying their vow of silence won’t hold up in court. Things are looking up when they manage to get Sister Woodhouse to testify in court against Hiram. Later that evening, there’s a small wrinkle as someone posted bail for the sisters. They left a message in their cell saying “we go to join thee” and Betty rushes back to the asylum to find all of the sisters dead, with blue lips, and bowing down to the gargoyle statue. Clearly, they won’t be testifying against Hiram. Betty is coping as well as can be expected for someone who brought home a bunch of random kids who were stuck in the hellhole of the Sisters of Quiet Mercy for who knows how long. Betty’s mother, Alice, is not really on board with continuing to have strangers in her house who wake up in the middle of the night like babies and continue to take up space in her home. In fact, Alice insists on sending the kids to the Farm but Betty protests, saying the kids have been imprinted on her and she wants to keep them safe. However, Betty finds a stash of Fizzle Rocks and one of the kids fesses up to Betty’s sister, Polly, about getting them from a Serpent. Polly and Evelyn Evernever showed up to bribe the kids to go to the Farm after a call from Betty’s mother. Polly expounded on how the Farm saved her after she got away from the sisters and how everyone there is equal but Betty is very much not for the idea. If that wasn’t enough, the kids begin to mistrust Betty when one of them encounters the Gargoyle King in the woods. Clearly, Betty lied and the Gargoyle King is still alive and poses a real threat to all of them. Realizing she needs help, Betty approaches Cheryl, former Mayor Sierra McCoy, and Fred Andrews to take in some of the kids when Child Services fails her. They all agree to help out but by the time Betty gets home, her house is empty except for her mother. Alice called the all-knowing Edgar Evernever from the Farm for advice and he graciously came and picked them all up. Now, I bet you’re wondering where Archie is in all of this? He’s currently living in a cabin in the woods somewhere in Canada. He seems to be some kind of park ranger but without the uniform. Someone on the other end of an old communications radio warns Archie that there have been bear sightings and to remain vigilant while clearing the trails. 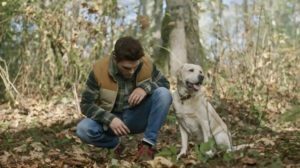 As Archie’s luck would have it, he gets attacked by a bear while out with his dog, Vegas, working the trails but he manages to get back to the cabin, radio for help, and bandage himself up as best he can. Archie stumbles onto his bed and goes through a series of hallucinations while bleeding out and waiting for help. You could argue that Archie was on his own vision quest of self-forgiveness for past offenses by playing Gryphons & Gargoyles with different players, however, this whole delusion is billed to Archie as a way to make it back to Eldervair…as in Riverdale. He starts with the three men dead who got him (wrongly) convicted. Archie’s first quest involved killing the Black Hood in the diner instead of just standing there while his dad got shot. Then he returns to the cabin to find he’s playing with Warden Norton and his next quest is to “kill the Man in Black.” Naturally, Archie confronts and kills Hiram Lodge with a knife. And finally whilst facing Betty, Jughead, and Veronica Archie finishes his game by killing himself against his father’s suggestion that it doesn’t have to be this way. The entire undertow of the episode is how fruitless it is to go against Hiram Lodge, let alone try and convict him as the witnesses always seem to end up dead and due to mitigating circumstances (like being fed drugs) those accounts will not be seen as reliable. We can only hope that something will change the tide. Reggie and Veronica share a kiss. That’s kind of a big deal. There haven’t been any seizures for weeks and all testing has come back negative. Hmmm.